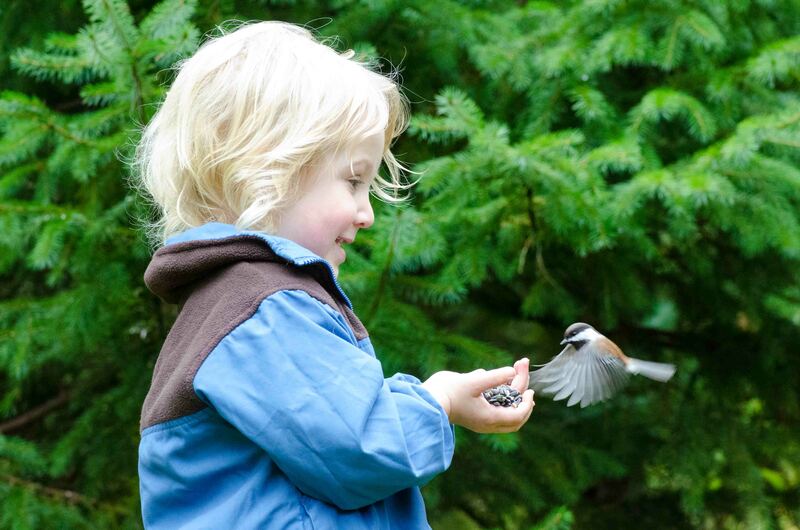 Ethan came over to my house one September day and fed the chickadees at my feeder. It was great. Although the birds were active and hungry, they took awhile to warm up to Ethan. I wanted to get this shot when I did because Ethan’s parents, Laura and John, were about to cut his hair and I worried that it wouldn’t be this long again for months, maybe years. I also thought his hair would darken as he aged and I wanted it to be strikingly blond. This image was taken with a Nikon D7000 camera and a 70-200mm Nikon lens, shot at 1/1,250th of a second on a cloudy day. ISO 1600, f8, and lightly enhanced in Lightroom. The shallow depth of field allowed me to soften the spruce trees behind my subject. I like photography that shows kids interacting with nature rather than incarcerated indoors with television or video games. That same day, I got a similar shot of Ethan’s older sister, Hannah. Laura and John framed the images into a montage and put them on the wall in their home.